Modern medicine and knowledge about dental care have helped us all to keep our natural teeth for much longer than in the past. However when a patient is missing a tooth, a dental implant is a great option to consider. 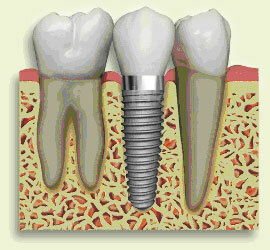 A dental implant can serve as a replacement for a damaged or missing tooth. Dr. Kederian works with highly trained and knowledgeable specialists to ensure that all her patients’ implants will be long-lasting and natural looking. The first step in receiving an implant is to visit a specialist, who removes the damaged tooth or makes a space in the patient’s mouth in which to place the hollow implant. Once the hollow implant is in place, the patient waits two or three months while his or her own natural bone grows around and stabilizes the implant (a process called Osteointegration). Once the implant is solid, Dr. Kederian fits a connector (called an abutment) into the hollow implant. Finally, a crown is attached to the abutment, finalizing the process. Dr. Kederian uses only the highest quality materials to ensure that her patient’s crowns will look and feel completely natural. Dental implants are an amazing way to restore missing spaces in the mouth, and to give patients confidence in their smiles. Implants give patients the ability to chew, bite, brush, and floss just as they would with a regular tooth. Additionally, implants do not develop cavities, so they are life-long restorations. There are several options to consider when replacing a tooth, and Dr. Kederian will be happy to discuss all of these options with you. Together, you can determine whether an implant is the right treatment for you. If you have any questions about implant dentistry, do not hesitate to call Dr. Kederian’s office. We look forward to your call.